Places I've Eaten: YOUR WEEKLY DIGESTION OF FOOD NEWS TO CONSUME.....PLUS RETURN OF COOKIE TIME! YOUR WEEKLY DIGESTION OF FOOD NEWS TO CONSUME.....PLUS RETURN OF COOKIE TIME! I realize I am late to the bakery party, but it's not like I hadn't heard of Mr. Holmes Bakehouse. I mean how could one not with it's neon famous sign and cruffins abounding on social media. Still, I hadn't made it over to the Tenderloin to try them out because, well, really, I have no good reason. Though I did find myself in their hood one afternoon and decided to stroll by. This time of day however, is not the time to go as they were pretty much out of everything, literally. Except for a savory thing and this cookie, my choice seemed made. Like I'm going to pass up a cookie! Chocolate chip with sprinkles of sea salt. That is the de rigueur cookie of the moment. As is any thing with sea salt. It's actually a pretty decent size in width and thickness for only $1.75 or was it $2? Either way, a relative bargain against some places in this town. Plus, it was a great cookie, even have probably sat there since that morning. It had a nice crispy outside and the inside was still soft with layers of chocolate between the dough which afforded a bit of chocolate in every bite. Being a salty sweet fan in general the addition of the salt flakes on top just make it better to me. These things are probably amaze balls fresh out of the oven all warm and gooey. 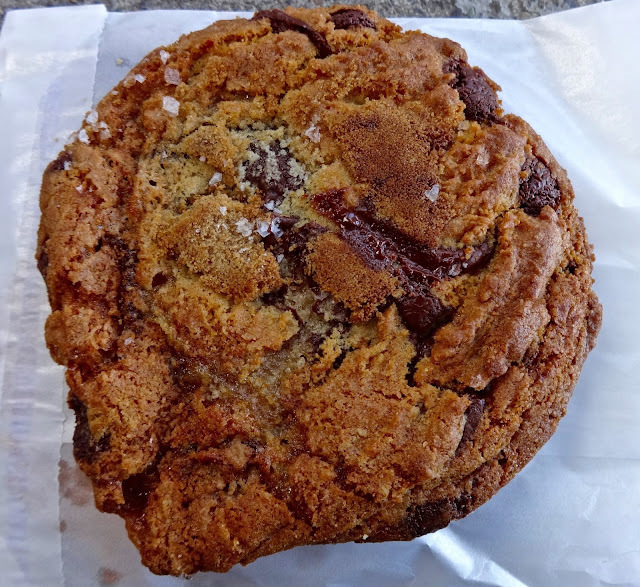 Still, as is, it is a winner and I'll rank it in the top 3 of cookies in San Francisco for flavor, size, proportionate chocolate and of course, cost. If they can take the most basic of cookies and make it taste this good I can only imagine what will be in store when I'm able to get my lazy a** up early enough to get over to the Tenderloin and buy an array of yummy baked goods. And really, how often do you hear anyone (me!) say something like that? Fusion food, KQED has finally figured out it's a thing in the Bay Area. Because you know you wanna know about it (plus it's in my hood) EaterSF has some pics and stuff on that new Taco Bell concept with booze. It lives! It lives! La Boulange rises from the ashes like a food Phoenix. With all the hot weather recently, The Infatuation folks decided to eat at every SF ice cream place--in one day. Ummm...how does one get that job? Because we never have enough social media in our lives, let's add a few food Instagram accounts to our ever burgeoning list. It's more mid-Market food madness. Now comes word on a food co-working space. Hoodline goes inside Triptych's fusion of art and food. Chef shuffles continue to abound around town. Seems there is talent to go around and round. Betelnut in the Marina-ish area is closing after 20 years. That whole lease thing and such. Though space won't be empty for long. See, as one place closes another opens in the Marina as Dorian makes it's debut. From barbecue joint to fancy oyster bar. Ugh, bring back the meat. And finishing off with even more chef shuffles around and round town.